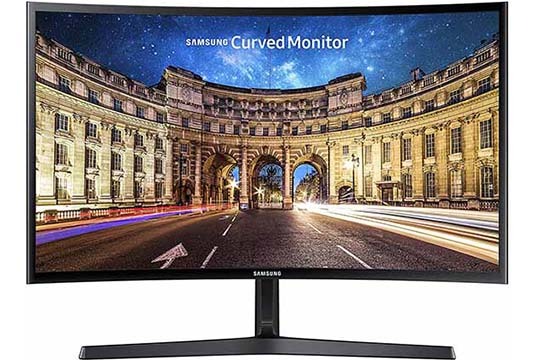 The Samsung C24F396 is an affordable curved monitor that’s great for gaming, work, and other everyday activities. It’s the upgraded model of the previous Samsung C24F390. In this review, we’ll go through its advantages and disadvantages, and compare it to similarly priced alternatives. The monitor uses a VA (Vertical Alignment) panel. So, you get an excellent contrast ratio of 3,000:1 which makes dark shades more distinguishable and vivid; black tones are considerably deeper as opposed to those on IPS and TN panel displays which have a contrast ratio of 1,000:1. VA panels also offer wide 178-degree viewing angles, so the image won’t notably shift in color, contrast, or brightness when you look at the screen at certain angles. Although the colors are rich with true 8-bit depth (16.7 million colors), IPS panels still offer more precise color reproduction, so if you do color-critical work, there are better options out there. Further, 1080p resolution on a 23.5-inch viewable screen of the Samsung C24F396 monitor results in a decent pixel density of 93 PPI (pixels per inch). So, the details are sharp and clear, and there’s a fair amount of screen real estate available. Now, while the 1800R screen curvature on a monitor of this size does make it appear more interesting, the viewing experience isn’t drastically affected. It might make games and movies slightly more immersive but it’s no certainly wow factor due to the small screen size. Moving on, the Samsung C24F396 curved gaming monitor has an input lag of ~11ms which is quick enough to eliminate any perceptible delays. Additionally, the response time of 4ms effectively removes trailing and motion blur of fast-moving objects. There is some slight smearing when dark pixels are predominant in the picture, but it’s tolerable. If you have an AMD FreeSync-compatible graphics card, you will be able to use FreeSync which synchronizes the monitor’s refresh rate to the GPU’s frame rate. As a result, screen tearing and stuttering is completely gone. However, the FreeSync range within which this variable refresh rate operates is only 48-72Hz/FPS (Frames Per Second) on the Samsung C24F396 display which is a shame considering there are similarly priced gaming monitors with wider VRR ranges (48-75Hz, 40-75Hz, etc). The (On-Screen Display) menu is easy to work with thanks to the joystick placed at the back of the monitor. You will find all the standard settings such as brightness/contrast, sharpness, color temperature, gamma (three presets), etc. 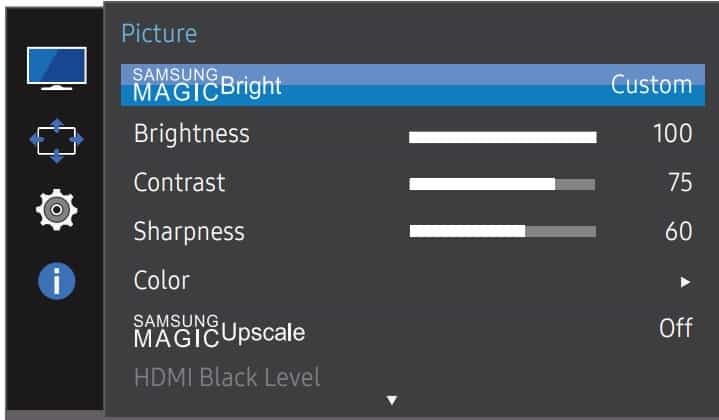 Other useful features include Samsung MagicUpscale which enhances the quality of low-resolution pictures and Eye Saver Mode which filters out the harmful low-blue lights. While the stand of the monitor is tilt-only by -4°/20°, you can mount the screen on a third-party stand via the 75x75mm VESA pattern. The overall design is very slim, but the bezels could be a bit thinner. Regardless, it’s a good display for a multi-monitor setup. Connectivity options include HDMI 1.4, VGA, and a headphones jack. 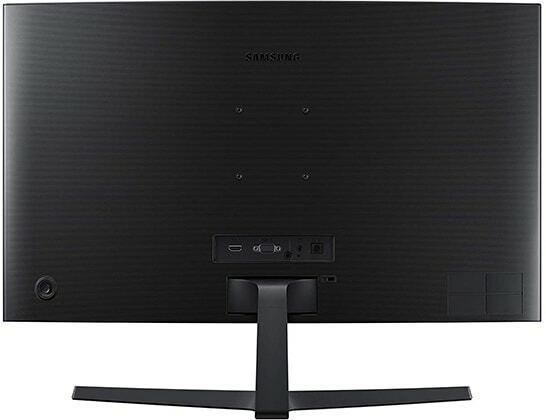 The Samsung C24F396 price amounts to around $150. It’s the cheapest curved monitor which along with its high contrast ratio make it a solid monitor for the price. However, the LG 24MP59G offer much better value for the money. It has an IPS panel, so you get more accurate colors and no smearing in fast-paced games. It’s not curved, but it has a wider FreeSync range (40-75Hz) as well as a DisplayPort port, so you can even use FreeSync with compatible NVIDIA cards. Moreover, it’s available under $150; you can read our LG 24MP59G review here. Alternatively, if you’re interested in a 144Hz gaming monitor, for just ~$20 extra, you can get the Sceptre C248B-144RN which is a 24″ VA-panel curved gaming monitor with FreeSync and 144Hz. Or, if you want a better 24″ 1080p 144Hz curved gaming monitor, make sure to check out the AOC C24G1. All in all, the Samsung C24F396 is an interesting display due to its curved screen and high contrast ratio which may win some users over even though there are better alternatives for the money available. 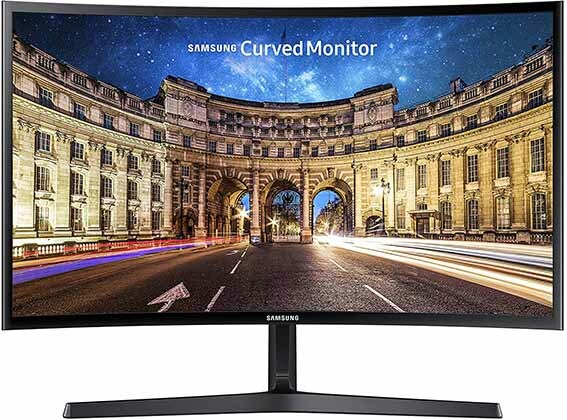 The Samsung C24F396 is an affordable curved monitor which thanks to its high contrast ratio provides an immersive viewing experience. However, when it comes to performance, there are better alternatives out there.